The Sweet as Honey Collection is here and it's so much fun! Life is busy and can “bee” overwhelming at times…and it’s in the middle of that chaos that you need to get “busy as a bee” with your creative side and refresh your soul with some fun and lighthearted art from the heart! The “bee-utiful” thing about creating art from the heart is thatwhether you’re needing to send “bee-lated” birthday greetings, remind someone to “bee-lieve” in themselves, or simply let someone know you’ll “bee” thinking about them, you’ve not only accomplished your act of kindness through remembering and touching the hearts of friends and loved ones with your creative projects, but you’ve refreshed your soul and refocused your heart as well! 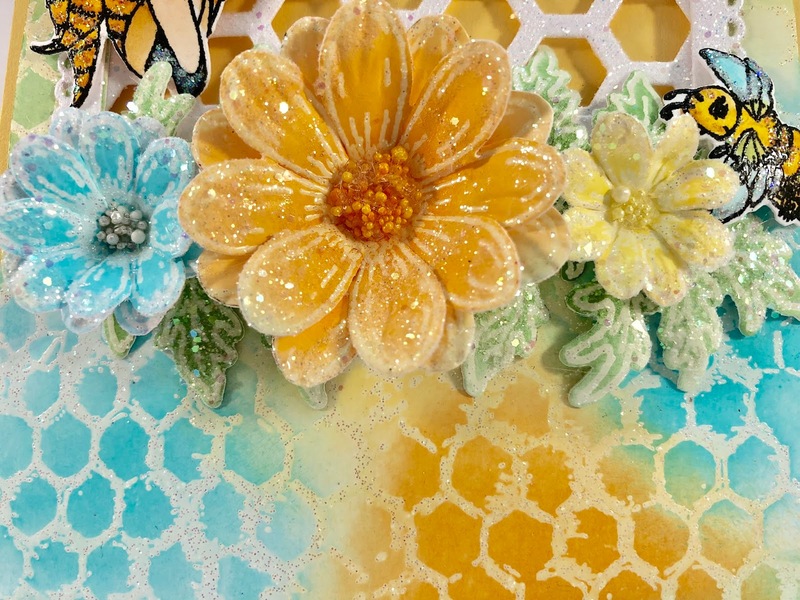 Join us in spreading joy and “bee-utiful” creations with the new Sweet as Honey Collection by Heartfelt Creations! “Swarming” with stunning illustrations of whimsical honey bees, charming hives and “bee-utious” garden scenes, this fun and lighthearted collection is ideal for creating projects for a multitude of occasions and is sure to capture the hearts of the young and the young at heart! A bright and happy hued paper collection will fill your soul with rays of warm sunshine yellows, bright sky blues and rich golden honey colors, while boasting captivating honeycomb patterns, happy hexagons, delightful polka dots, perfect plaids and dreamy florals! 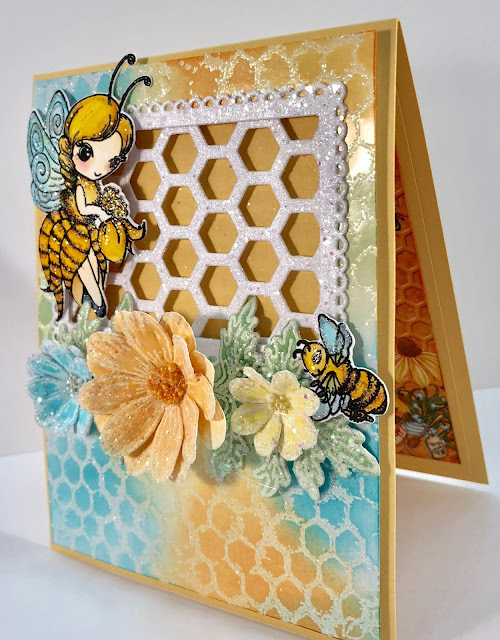 An assembling of three “bee-coming” cling stamp sets, along with coordinating dies provide endless inspirations with a “bee-utiful” colony of honey bee maidens, whimsical hives and sweet sentiments, ideal for pairing with honeycomb die cuts! So, now that you know what all the “buzz” is about, join us in “bee-ing” Sweet as Honey and sharing “bee-utiful” art from the heart wherever you go! Here's the card I created for the launch. Instructions: Card is 4 1/4 x 5 1/2”. Cut saffron cardstock 4 1/4 x 11”, score at 5 1/2” on the long side and fold to create card base. Cut the glossy cardstock 4 x 5 1/4”. Cut designer paper from the paper collection 4 x 5 1/4” and adhere to the inside of the card base with dries clear glue. Stamp the honeycomb image on the glossy cardstock randomly using VersMark ink. Sprinkle with WOW Clear Sparkle embossing powder and heat set using the Heat It Tool. Use the Mini Blending tool and blending foam to ink the cardstock with the Sunflower, Tiger Lily and Aquamarine archival inks. Use a paper towel to rub the color off of the embossed image. Cut an aperture in the glossy cardstock using the Eyelet Rectangles & Basics Die setusing the second smallest die. Cut a frame from pearl white metallic cardstock using the second and third smallest dies. Diecut the honeycomb from pearl white metallic cardstock. Sponge the frame and honeycomb with dries clear adhesive and sprinkle with Rajni Chawla’s Crystal Clear glitter. Adhere the frame to the front of the aperture and the honeycomb on the back of the aperture. 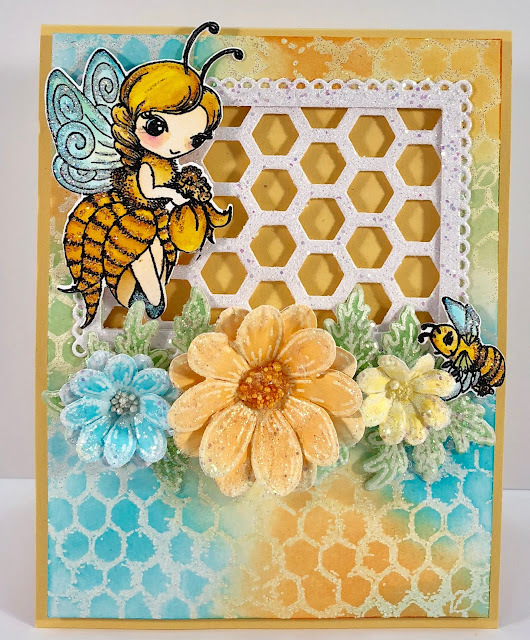 Stamp the Honey Bee Maiden and the bumble bee on watercolor cardstock with VersaMark, sprinkle with black embossing powder and heat set using the Heat It tool. Color using the Zig Clean Color Real Brush markers and Kuretake water brush. When dry, use the Quickie glue pen to adhere Lion’s Mane glitter to the bees and Crystal Ultrafine Transparent glitter to the wings. Lightly shape using the deluxe flower shaping kit. Stamp the Delightful Daisies and leaves on white cardstock using VersaMark, sprinkle with WOW Clear Sparkle Embossing Glitter and heat set using the Heat It tool. Color the flowers using the Tiger Lily, Aquamarine and Sunflower Archival inks and color the leaves using Olive Archival Ink. Wipe the excess ink off of the embossing using a paper towel. Diecut using the coordinating dies, place face down in the mold, spritz with water and run through the die cutting machine. Finishing shaping using the deluxe flower shaping kit. Use two large petals for the Tiger Lily flower, two medium petals for the Aquamarine flower and one small petal for the Sunflower color flower. Add dries clear adhesive to the flower centers and add Minnie Pearls, Go Man Go and Lemon Chiffon prills. Let dry and then sponge dries clear adhesive on the flowers and sprinkle with Rajni Chawla’s Crystal Clear. Adhere the flowers and leaves as shown using the hot glue gun. Adhere the bees using dimensional dots and dries clear adhesive. If you want to see some absolutely gorgeous projects created by the fabulous design team, be sure to stop by the Heartfelt Creations Blog. I love this! So much sparkle; I'm definitely a glitter girl! Thank you so much Glenda! I do love sparkle! Wow I love all the details in this card!! Beautiful Janet! 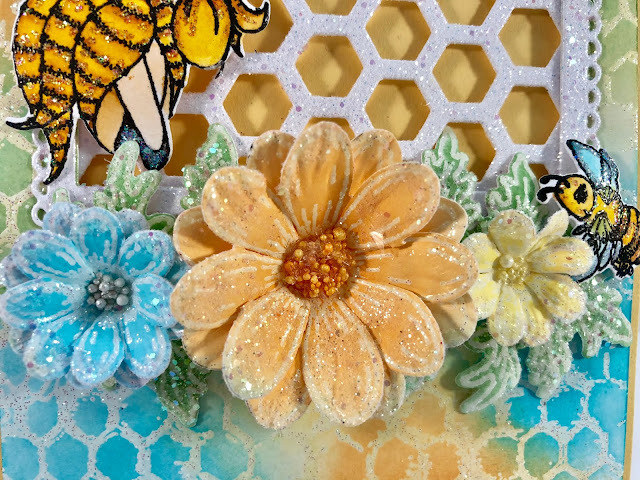 I love the honey comb embossed bg resist! Beautiful flowers and cute as a button bees! What a beautiful card! Hugs!